Numerous questions remain unanswered. Was the site [Shiloh] practically unoccupied during the Bronze Age, or did the Israelites occupy a site already sacred? When did they take it, during the Bronze Age, or at the beginning of Early Iron? This is another of the sites, which, like Ai and Jericho, can assist in determining the date and character of the Hebrew conquest. Was the place unoccupied during the Middle and Late Iron Ages, that is after the loss of the Ark? And was it destroyed by the Philistines, or did it gradually fall into ruins after the loss of the Ark? — McCown, Chester C. “Archaeological News.” American Journal of Archaeology 34, no. 1 (1930): 96. In 1838, the great American Orientalist Edward Robinson linked the ruins at Khirbet Seilun, 20 miles north of Jerusalem, with the famous Israelite cultic site of Shiloh. Almost three decades later, in 1866, Major Charles Wilson, on behalf of the Palestine Exploration Fund surveyed the ruins (Wilson, 1873, 38). A few years later the French explorer Victor Guérin documented what he observed at the site (Guérin, 1875, 21–23). In the 1880s, Conder and Kitchner did the same in their Survey of Western Palestine (1882, 368). Following World War I, the Danish set their sights on excavating Shiloh, with initial soundings being executed by Aege Schmidt in 1922. With the help of Albright, Schmidt correctly identified the basic ceramic sequence at Shiloh (Albright, 1923, 10). Three seasons of excavation followed in 1926, 1929, and 1932 under the skilled direction of Hans Kjaer, with the helpful guidance of Albright and steadfast support of Schmidt. Kjaer tragically died in the middle of the 1932 season. The cause of his death remains uncertain. Glueck describes it as exhaustion from the excavation (Glueck, 1933, 66), while others attribute it to dysentery (Anonymous, BAR, 3). Albright handed the reins of the excavation to his brilliant protégé Nelson Glueck who promptly closed the dig, without explaining his reasons. In 1963, the Danish, under Svend Holm-Nielsen, returned to execute a final series of soundings before publishing the long-awaited final excavation report in 1969. From 1981 to 1984, Professor Israel Finkelstein, on behalf of Bar Ilan University, excavated Shiloh, publishing his final report in 1993. Finkelstein corrected some of the errors of the Danish excavation. Notably, he discovered a large bone deposit in Area D, with a large quantity of Late Bronze Age (LB, or c. 1483–1177 B.C.) pottery, some of which was cultic. Furthermore, Finkelstein states, “There were also several dozen Cypriot sherds. Most of the pottery is of the LB I horizon. There is also a small quantity of LB II pottery, although not from the end of the period” (Finkelstein, 1993, 45). In Area C, Finkelstein connected with the work of the Danes and fully exposed Iron Age (IA) I (c. 1177 – 980 B.C.) “storage rooms” filled with pithoi of the collared-rim type. Surprisingly, these storerooms lie outside the perimeter wall. To us, this points to a construction date prior to the Philistine arrival in 1177 B.C. when Shiloh, like the meaning of its name, operated in relative tranquility. In contrast, Finkelstein assigns a date of c. 1150 B.C. to the Area C buildings. 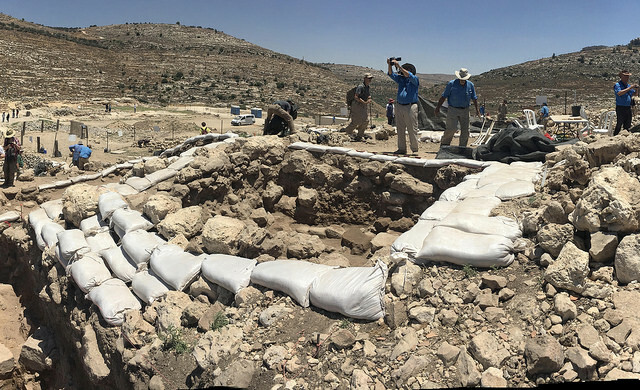 Shortly after Finkelstein concluded his work, Ze’ev Yeivin, on behalf of the Israel Antiquities Authority, conducted limited excavations on the scarp just north of the tel (the northern platform) followed by work in a few other areas. Based on the scarp’s dimensions, Wilson had advocated for it as the location of the Israelite tabernacle (Kaufman, 1988). 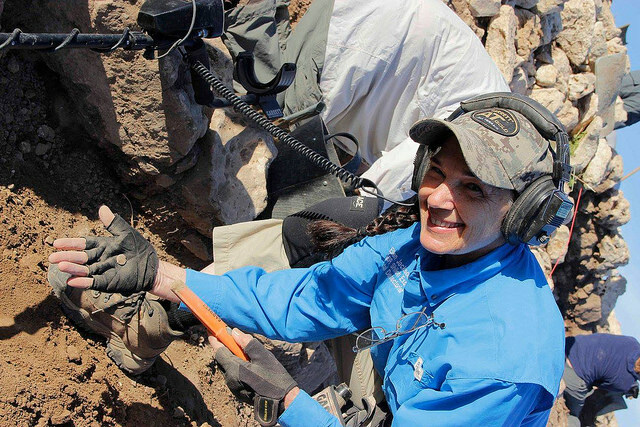 In the last decade, under the guidance of Hananya Hizmi, Staff officer of the Civil Administration of Judea and Samaria, further excavations have been conducted near the summit, on the aforementioned scarp, and the churches and other structures along the southern approach to the site. 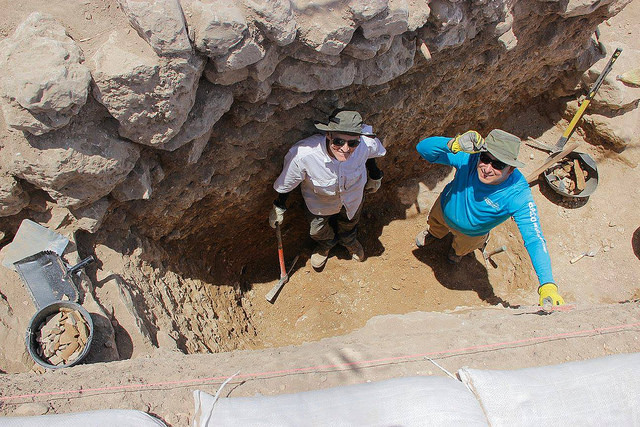 Evgeny Aharonovic led the excavation of the churches, and Reut Ben-Arie supervised the work on the summit, northern scarp, and southeastern fortifications. In 2017, The Associates for Biblical Research (ABR), under the direction of Scott Stripling, conducted Season One of a planned multi-year expedition, which this article summarizes. The time between c. 1750–1650 B.C., which corresponds to the “MB (Middle Bronze) IIb” period, witnessed the establishment of a village without walls at the site of Shiloh. Only pottery testifies to this foundational phase. During the ensuing period (“MB III/MB IIC”, or c. 1650–1483) the residents of Shiloh constructed a massive fortification system that enclosed 17 dunams (4.25 acres). MB III in the southern Levant witnessed a proliferation of similar fortification systems. Examples include Khirbet el-Maqatir, Jericho, Shechem, and Gezer. The MB III city at Shiloh, designated as our City One, suffered destruction by unknown invaders, perhaps the recently expelled Hyksos from Egypt. Resilient residents quickly rebuilt, or at least resettled Shiloh as a cultic center in the Late Bronze Age. Pit deposits of bones, cultic vessels, scarabs, and an abundance of pottery establish this fact. The LB inhabitants apparently continued to use the MB infrastructure. 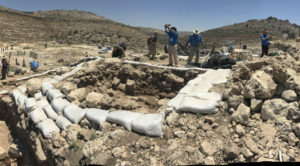 Israel Finkelstein, who excavated Shiloh from 1981 to 1984 on behalf of Bar Ilan University, assigned an area that contained a faunal deposit to an Israelite cleanup of the remnants of Amorite sacrifices on the summit. 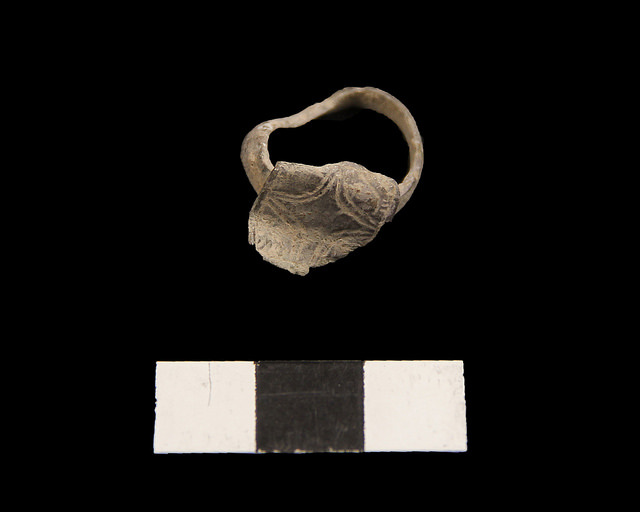 The deposit, however, rich in LB pottery, may serve as evidence of the Israelite sacrificial system that began c. 1400 B.C., assuming an early date for the Exodus and Conquest. In Season One, we excavated an atypically large quantity of animal bones. According to the Hebrew Bible, the Amorites controlled the Shiloh region at the time of the conquest (Num 13:29 [Highlands]; Josh 7:7 [Ai]; 2 Sam 21:2 [Gibeon]), and this likely extended back to MB III (c. 1650–1483 B.C.). Shiloh plausibly fell within the realm of the city-state of Shechem to the north since it lies ten miles north of Khirbet el-Maqatir, a likely northern border fortress for the southern city-state of Jerusalem (Finkelstein and Na’aman, 2005, 186). The site remained active until a possible second destruction, perhaps at the hands of the Philistines (1 Sam 4), which occurred c. 1050 B.C. Season One in Field H1 failed to yield evidence of this destruction in our Stratum V, so clarification of this proposed destruction ranks as a priority in the coming seasons. Prior to our first season of excavation, scholars widely held that IA (Iron Age) II (c. 980–587 B.C.) witnessed only a small settlement at Shiloh (1 Kgs 11:29 and 12:15; Jer 41:5), but we found that the IA II footprint exceeded that of the IA I footprint. This harmonizes with the findings of the Civil Administration team on the northern platform (Livyatan and Hizmi, 2017, 50). While we found a small amount of Persian and Early Hellenistic (c. 332–167 B.C.) pottery, the latter part of the Late Hellenistic period (c. 167–63 B.C.) saw a major resettlement at the site, and this pattern accelerated in the Early Roman (ER, or c. 63 B.C.–A.D. 136) period. We now have evidence that virtually the entire site experienced settlement in the ER period. Byzantine era (c. A.D. 325–636) builders matched this construction zeal. The city continued through the Early Islamic Age (c. A.D. 636–1099) and into the Middle Ages when apparently the Black Death or some other pestilence finally brought an end to life at ancient Shiloh. Season One focused on ten 5×5 meter squares in Area H1 on the northern slope of the tel, with the intention of exposing the outside, top, and inside of the perimeter wall. This area lies between the Kjaer and Finkelstein excavations. We opened two squares (AC29 and AD29) directly connected with the Danish excavation in Areas F and H, thus continuing to expose the storage rooms inside the MB III fortification wall. At the other end of the field, Wall 6 in square AH30 clearly connects to Finkelstein’s work in Area K.
The MB III fortification wall (our Wall 1) ranges from 5.3 to 5.7 meters thick. It has a denticulated or “saw-tooth” pattern, a 1 meter wide jutting out of the entire wall, an unusual feature for the Highlands Region. Whether this massive wall functioned as a fortification wall or merely as a perimeter wall for a temenos remains unclear in light of the absence of domestic architecture from the BA and IA inside the wall. Finkelstein’s excavations revealed a massive glacis protecting the foundations of the wall, with no additional fortification. The absence of towers buttresses the hypothesis that the wall merely supported a religious platform. Our excavations proved inconclusive in this regard. While we found a glacis, it did not encircle the entire wall, perhaps being partially removed by later builders. All around Wall 1, we found an abundance of mud brick in various states of decay. This detritus suggests the existence of a mud brick superstructure atop the massive wall, a common building technique for this time period. This evidence hints at a city and not just a cultic platform. The range of colors suggests phases or refortification of the wall over time. After the first season, we adjusted previous stratification theory and clarified the occupation on the northern side. Our excavations showed a larger IA II presence at the site than was previously realized. In fact, the IA II footprint in Area H1 exceeds the IA I footprint. It was also thought that the ER city only covered the southern portion of the tel. We, however, found extensive evidence of an ER presence on the northern side of the tel: portions of villas, objects, 100 coins, and a large volume of diagnostic pottery. Likewise, the Byzantine remains exceeded our expectations, as evidenced by large terrace walls and an enigmatic augment to the exterior of Wall 1A. The Season One cultic remains consist of fragments of ceramic cultic stands. Of possible significance, the quantity of animal bones exceeded what we expected based on our previous excavation experience. Only additional excavation will determine if another large bone deposit, like Area D, exists at Shiloh. 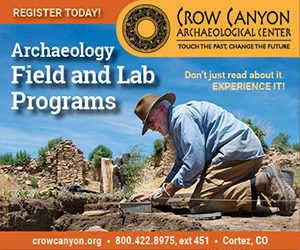 The forthcoming zooarchaeological report from Season One will answer a number of questions. Are the bones from animals connected with the biblical sacrificial system? Are these young animals, which are required in the biblical sacrificial system? The analysis will also illuminate the diet of the ancient inhabitants. We pride ourselves in the technological advances at Shiloh. We became one of the first in Israel to go 100% digital in the field. Supervisors record data on PDF forms on their iPads, which are backed up daily to our database. We methodically metal detect each locus, a rarity for this region. The resulting metallic discoveries are astounding. In our first season at Shiloh we located 240 coins (100 from Area H1), plus other metal objects like an MB axe and dagger. Outside of Jerusalem, we were the first, to our knowledge, to wet-sift our material. The additional excavation protocol yielded a scarab, beads, coins, and other small objects missed by the volunteers in the square and by the dry sift team. We plan to upgrade the wet-sift process for next season. We also plan to implement a three dimensional digital photography of the squares which will allow us to have a 3D rendering of each square, to see the progress of the excavation, and pinpoint measurements and objects. Furthermore, we regularly fly a drone to capture macro and micro overhead shots. All of this technology enables us to make data driven decisions regarding how, when, and where we excavate. Finally, several staff members, led by Leen Ritmeyer, spent the week following the excavation restoring several unstable walls that we exposed, using state-of the art materials and techniques. It will take at least five seasons to adequately address our original research objectives. We also have a strong interest in excavating the summit of Tel Shiloh, which could take another few years. 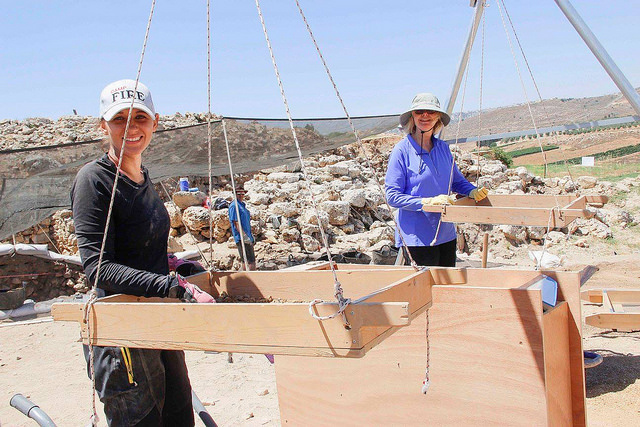 Hopefully, our work will shed light on the location of the Israelite Tabernacle at Shiloh. For a full discussion on this topic see my (Stripling) 2016 article in Bible and Spade (Stripling, 2016, 88-95). The more that we uncover of Shiloh, the more questions tend to arise. So, we could be here for decades. For now, we take it one season at a time, filtering through almost 4,000 years of human history. 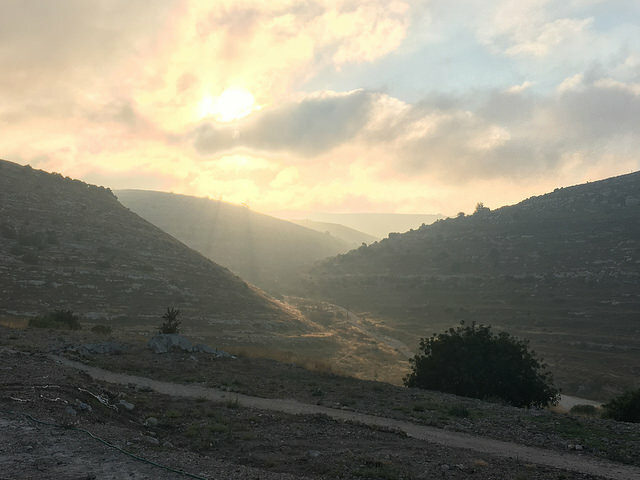 Although Shiloh now ranks among the largest excavations in the southern Levant, we have saved a spot for you to join us. For details, visit www.digshiloh.org. Albright, W.F. “The Danish Excavations at Shiloh.” Bulletin of the American Schools of Oriental Research 9 (Feb 1923): 10-11. Anonymous. “Did the Philistines Destroy the Israelite Sanctuary at Shiloh?” Biblical Archaeology Review 1.2 (March-April 1975): 1-6. Conder, C. R., and Kitchner, H. H. The Survey of Western Palestine Memoirs 2, Sheets VII–XVI, Samaria. London: Palestine Exploration Fund (1882). Finkelstein, Israel, Shlomo Bunimovitz, Zvi Lederman, and Baruch Brandl, eds. 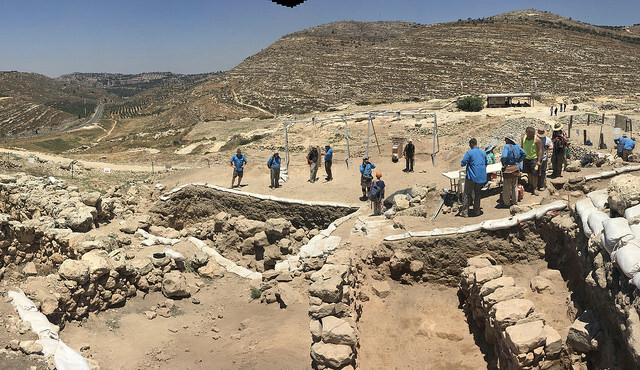 Shiloh: The Archaeology of a Biblical Site. Monograph Series of the Institute of Archaeology 10. Tel Aviv, Israel: Institute of Archaeology of Tel Aviv University (1993). Finkelstein, Israel and Nadav Na’aman, Shechem of the Amarna Period and the Rise of the Northern Kingdom of Israel, IEJ 5 (2005): 172–93. Glueck, Nelson. “Palestinian and Syrian Archaeology in 1932.” American Journal of Archaeology Vol. 37.1 (Jan-Mar 1933): 160-172. Guérin, V. Pp. 21–23 in Vol. 2 Samaria of The Survey of Western Palestine: Memoirs of the Topography, Orography, Hydrography, and Archaeology. 3 vols. London, U.K., 1875. Hizmi, Hananya, and Reut Livyatan-ben-Arie. 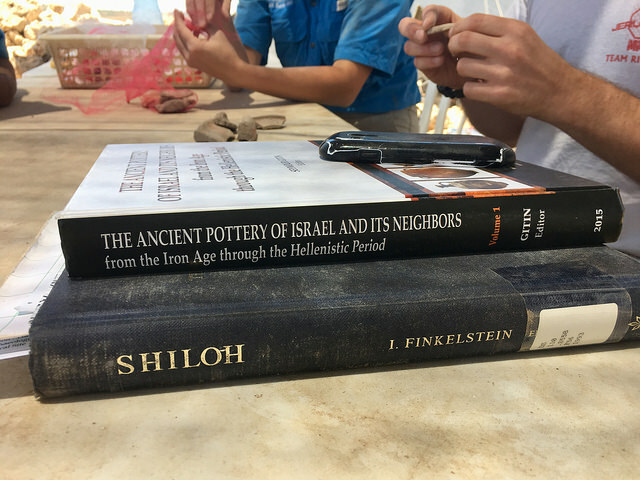 “The Excavations at the Northern Platform of Tel Shiloh the 2012-2013 Seasons [Translated from Hebrew].” Edited by D. Scott Stripling and David E. Graves. Translated by Hillel Richman. Near East Archaeological Society Bulletin 62 (2017): 35–52. Kaufman, Asher S. “Fixing the Site of the Tabernacle at Shiloh.” Biblical Archaeology Review 14.6 (Nov-Dec1988): 42-49. Stripling, Scott. “The Israelite Tabernacle at Shiloh.” Bible and Spade 29.3 (Fall 2016): 88-95. Wilson, Charles W. “Shiloh.” Palestinian Exploration Fund: Quarterly Statement 5–6 (1873): 22-39.